Since I began teaching at ICP a few years ago I have been a bit of a discouraging stickler when my students bring in photographs of their own plates of food. 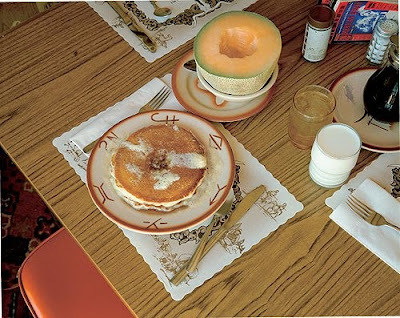 I generally don't find these photographs to be very interesting as art photographs and they are so heavily derivative of the iconic Stephen Shore Photograph of Trail’s End Restaurant in Kanab, Utah. 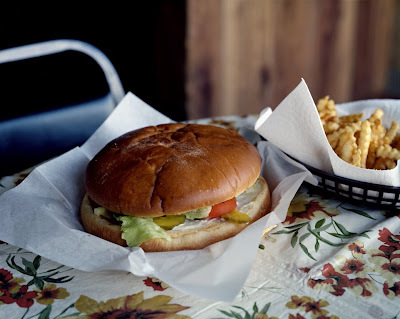 Well that unwritten rule was broken by me on my cross country trip last month due to an oversized hamburger that I couldn't resist shooting and subsequently eating. This burger was ginormous - a 1lb burger on an 8" bun (I shared it) and quite delicious. At first I couldn't figure out why on their menu a hamburger was $15 dollars - I was in the middle of Idaho after all, then the waitress explained to me about it's supersize status. I apologize to all my students and am here to say shoot away at your plates of food! These images will likely age well. That's a big reason why the Shore photograph has such resonance - it so richly encapsulates a specific era and style.